Armed Forces Day is a special holiday for people all over the world to come together and thank the men and women of the United States Armed Forces. First conceived by President Harry S. Truman, the holiday was established in 1949. The creation of a single day celebration for all five branches of the United States military made sense due to its recent unification under the Department of Defense. Today, Armed Forces Day is celebrated on the third Saturday of every May. Be sure to mark your calendar & support our military! United States Secretary of Defense Louis Johnson announces a single holiday to celebrate all branches of the military. Armed Forces Day is celebrated for the first time. President John F. Kennedy establishes Armed Forces Day as an official holiday. President Trump sends out a statement supporting the holiday and its almost 70 years of tradition. National Armed Forces Day is traditionally celebrated with parades honoring military service. Open houses, air shows, and other local celebrations usually accompany a parade. There are numerous local parades across the United States; there is sure to be one near you! Military or government personnel will routinely set up historical or educational displays for the public. Visiting a showcase like this can be eye opening as well as fun. This also gives civilians an opportunity to interact with military personnel face to face. There are often special ceremonies at military memorials or cemeteries on National Armed Forces Day. Buglers perform the memorial song “Taps” in honor of fallen soldiers. This is a great way to show respect and appreciation for members of the military. Current army troops wear blue instead of green as a tribute to George Washington and the men in his first command. The Marine Corps went to the extent of including the letters “USMC” when designing their uniforms so that other branches wouldn’t be able to use their design. It turns out there’s no significance to the three pin-stripes on the Navy jumper other than the fact that a majority of the men were decorating their collars with various types of white stripes — so it became part of the uniform. The wide-bottomed pants that sailors famously wear are constructed that way so that they can easily be folded up when performing duties that involve them getting their feet wet. 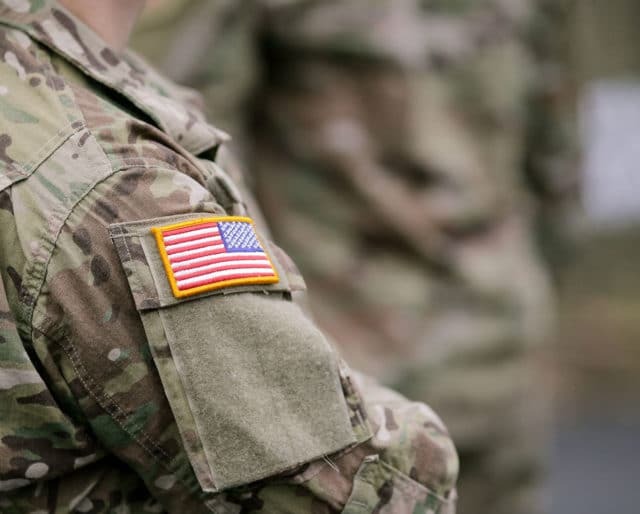 The American flag patch on military uniforms has the stars on the right and stripes on the left in order to give the effect that it's blowing in the breeze. Joining the US Armed Forces is an incredibly selfless act that deserves recognition. Soldiers and other military personnel risk their lives every day to keep citizens safe. This holiday is an opportunity for the average person to show support for that sacrifice. National Armed Forces Day is an opportunity to educate yourself or others. The holiday was originally designed to help citizens better understand the military and its role in our society. We can all do our part by spreading knowledge and understanding. The military is made up of five branches — the Army, Navy, Marines, Air Force, and Coast Guard. This holiday is intended for members of all five of these branches. Originally it was meant to replace separate branch appreciation holidays, but these are also still celebrated today.